Tracked crusher is a kind of efficient crushing equipment, which adopts self-drive mode, possesses advanced technology and complete function. Under any terrain condition, this equipment can get to anywhere of work place, in this way, it can decrease the operation to the material, in addition, it is also convenient to comprehensively assist the coordination of mechanical equipment. 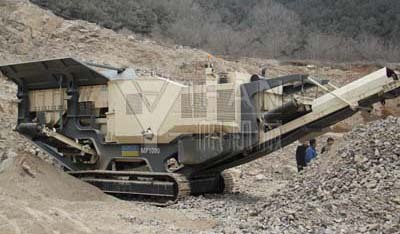 By the control of wireless remote, it is easy to place the tracked crusher to trail car and transport to the operating site. Because it does not have to spend on assembly time, therefore the equipment can throw into work immediately when it arrives at operating site. Jaw plant is of uniform finished material size, high production rate and crushing ratio, in addition, its optimal design can satisfy the most needful technical characteristics for tracked crusher. It is a kind of typical multifunction construction machinery product,which integrates with mechanism, electricity, and hydraulics. Its structure is firm; the dimension of whole machine has different types. The noise silencer of mobile crushing and screening plant is the best noise absorption system. This equipment is compact and flexible. It can satisfy the construction waste crushing work in the urban area. For transportation the head-piece can be folded.